The popular franchise created by Rovio continues to reap success, which has led to the release of multiple versions of the original Angry Birds . In this regard, the company has recently released a new update for Angry Birds Star Wars II in which 40 new levels have been added in addition to those already previously had. Recall that Angry Birds Seasons was also updated and also additional levels were added, it seems that this is a tendency for new versions. This new update with 40 levels is available in two versions: a free version that includes advertising and a paid version which removes the advertising. In both cases, the update is available through the store of Google Play applications and what is known, the update would include 20 new secondary levels of pigs and birds 20 secondary levels. Along with the inclusion of more levels, Rovio also mentions that players can access secret levels, as well as new free characters. Regarding the secret levels, users must find the hidden maps, and once these levels have been discovered, you can get 4 new unlock secret levels. As for the new characters here include names like Padme, Zam Wesell and Captain Panaka.Thus, users can not only enjoy these new levels, but also to use new characters. 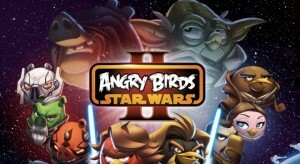 Angry Birds Star Wars II was released in mid-September, but arrived shortly after the first update that similarly added new levels and characters. At that time the update introduced the hologram Darth Sidious, Battle Droid Red, Silver C3PO , among others. In this update also had secret levels and levels of special reward for the characters.